The blog has been silent for too long! This year, my husband and I have been focused on quite a few major life changes. We will soon be moving to Pittsburgh, and in December, we will be welcoming our first child into the world. With so much going on in our personal lives, some things had to be set aside. For me, the blog was the main recipient of my neglect. Phase 1: Pack the house. Phase 2: Move to Pittsburgh. Phase 5: Get ready for baby. We’ll see how the blog holds up through it all. Work does not look like it will slow down during any of these phases, however, and I am excited to update you all on some of the projects that I have been working on. Over the next few months, I hope to share a few posts about some of the great work I have been able to be a part of. I can’t wait until I can share the fruit of these amazing writers’ labors! 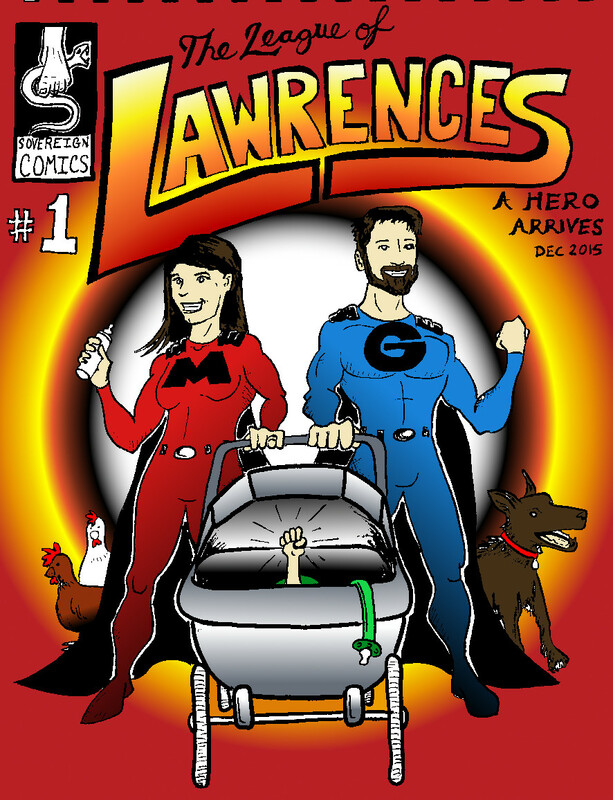 As you wait for future posts, check out this amazing comic my talented husband drew to announce our pregnancy. See you back here soon! “Prune out the small words that qualify how you feel and how you think and what you saw: ‘a bit,’ ‘a little, ‘sort of,’ kind of,’ ‘rather,’ ‘quite,’ ‘very,’ ‘too,’ ‘pretty much,’ in a sense’ and dozens more. They dilute your style and your persuasiveness. “Don’t say you were a bit confused and sort of tired and a little depressed and somewhat annoyed. Be confused. Be tired. Be depressed. Be annoyed. Don’t hedge your prose with little timidities. Good writing is lean and confident. “Don’t say you weren’t too happy because the hotel was pretty expensive. Say you weren’t happy because the hotel was expensive. Don’t tell us you were quite fortunate. How fortunate is that? Don’t describe an even as rather spectacular or very awesome. Words like ‘spectacular’ and ‘awesome’ don’t submit to measurement. ‘Very’ is a useful word to achieve emphasis, but far more often it’s clutter. There’s no need to call someone very methodical. Either he is methodical or he isn’t. When it comes to writing, I agree thoroughly with Zinsser. Yet in everyday conversation, I also enjoy mixing adjectives. When something surprises me, I like to tell people that I am “mildly terrified.” In fact, if you were to meet me in the grocery store, my occupation may not be readily apparent. I don’t like to correct the grammar of people I meet casually. Though I wince inwardly when someone says “weary” even though they mean “leery” or “wary,” I usual only mention such pet peeves to close friends. My husband knows that I edit life in my head, but I strive to be sensitive to the fact that not many people care about grammar as much as I do. For that matter, in day-to-day life I don’t even care about grammar as much as I do when I am editing. I’ll admit it . . . I tell people daily that I am “doing good,” even if I am not working for Habitat for Humanity or serving in a soup kitchen at just that moment! When we speak, our words do matter, but so does our ability to connect with those around us. I’d rather speak colloquially and be relatable than concern myself so much with the finer points of grammar that I can no longer carry on a normal conversation. Choose your words carefully, but give yourself (and others!) the freedom to make a mistake or to intentionally play with the beauty and fluidity of language. What about you? What language rules do you knowingly break in casual conversation? What do you think about when you can’t seem to fall asleep? My mind often begins racing just as my body is desperately ready for rest. When I was younger, my dad often read me Dr. Seuss’ The Glunk that got Thunk. In this story, a young girl enjoys spending her evenings thinking. But when her Thinker-Upper gets out of hand, she thinks up a crazy creature called a Glunk. When my mind would spin at night (which led to endless repetitions of “Wait, Dad! One more question. . . “), my dad would tell me to “turn off my Thinker-Upper.” I still have to remind my Thinker-Upper to shut itself down most nights. “You can’t pick pickled peppers,” Peter Piper piped. ‘Till the pickler packs it tight! The stories of two opposites.